This site is a free non-profit repository of materials from GAP/R George A Philbrick Researches, the company that launched the commercial use of the Operational Amplifier in 1952. The first commercial Operational amplifier was the K2-W op-amp. It was based on the amplifier used in the Philbrick modular Analog-Computor "black boxes ". That amplifier's basic circuit architecture, in turn, was probably inspired by an earlier amplifier designed by Loebe Julie (Dan Sheingold and Bob Pease, thanks for helping me with this information). The K2-W Operational Amplifier entered the commercial market in 1952. Amateur Science, Cool Science, Gravity, Energy, Fusion, Tesla Coil Page. Neodymium Supermagnets, Science Toys. Significantly Worthwhile Books, Science Fair Ideas, Science Demos Articles, Experiments, Exhibits, Kids’ Science Projects, The Science Club. Projects for beginners, articles on electronics and electrical science, Tesla coils, electrostatic devices, and resource links for the hobbyist and educator. I am using the word MakerSpace for the same Hackerspace. I would rather call them plain TinkerSpace, where youngsters take apart, fix, build Hardware, Software, Webware, Robots and Machines. Sony used to get the abandoned ww2 radios in the islands to design, make and sell their first radio units. Honda used to fix bikes from europe and america to gain the skills and mutate to a global giant. Take apart, reverse engineer, fix and learn. Hackerspaces are community-operated physical places, where people can meet and work on their projects.This website is for 'Anyone and Everyone' who wants to share their hackerspace with international hacker's'paces. Every kid is a born hacker and he starts with his toys, his mom does not like that, but he does not stop. One day he is building something pretty big. Dallas Makerspace Wiki - Membership based, non-profit, shared community workshop and laboratory. Milwaukee Makerspace - Social club for people who like build, invent, tinker and/or collect new skills and expand their minds. In the late nineties and the early 2000. There were Hobby DIY Groups, Ham Radio Groups and Learning Electronics Communities. 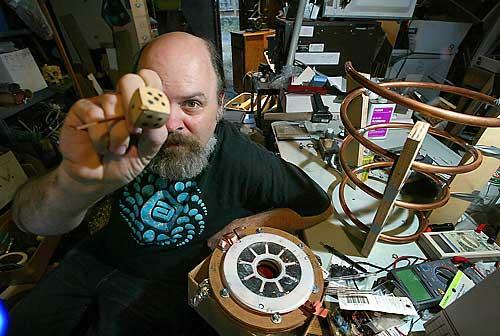 Hackerspaces by function, may be as old as technology itself. People working in a garage or shop to learn skills or build-invent something, but with different names like "Metal Tinkering Club" etc.. Recently the people at Make created a more organized and sustainable movement, that is helping the "MakerSpace" Phenomenon Emerge - Makezine - MAKE brings the do-it-yourself mindset to all the technology in your life.